With yesterday’s race in Oregon, I had completed triathlons in half of the states of the USA. Today, I would start the second half with the triathlon in the state of Washington. After the awards ceremony for the Best in the West Triathlon, Joy and I pointed our van to Wildcat Lake Park, a county park outside Bremerton, Washington. Our goal was to reach the park in time for packet pickup for the next day’s race. We reached the park, which is located within 10 miles of the eastern edge of the Olympic National Park, with time to spare and collected the race packet. There is no doubt in my mind that Lisa Ballou is the reason for the longevity of Tri Turtle Tri. She is organized and among the most enthusiastic of race directors I have met. Lisa’s email signature – ‘Lisa B, your Tri Turtle’ – gives you a sense of her fun-loving personality. After a single sentence description of the race course, Lisa dedicated the remaining space to encouraging those less-than-confident swimmers. I know that if I were concerned about the swim, I would feel a whole lot more comfortable knowing that the water was filled with people ready, willing, and able to help me complete this first leg of the triathlon. 2015 was also the 10th year that Tri Turtle Tri donated part of its proceeds to local fitness and wellness programs, which included a free community wide “Family Fun Run” to encourage families to greater fitness. This was the also the third year that Tri Turtle Tri, through Tri Turtle Wellness, had awarded a college scholarship to a Klahowya secondary school graduate. The scholarship was based on the student’s essay describing how the Kitsap Tri Babe motto, “The miracle is not that I finished, the miracle is that I began,” was relevant to their life. Race director Lisa Ballou with two of the members of the Klahowya Secondary School cross country team she had coached. 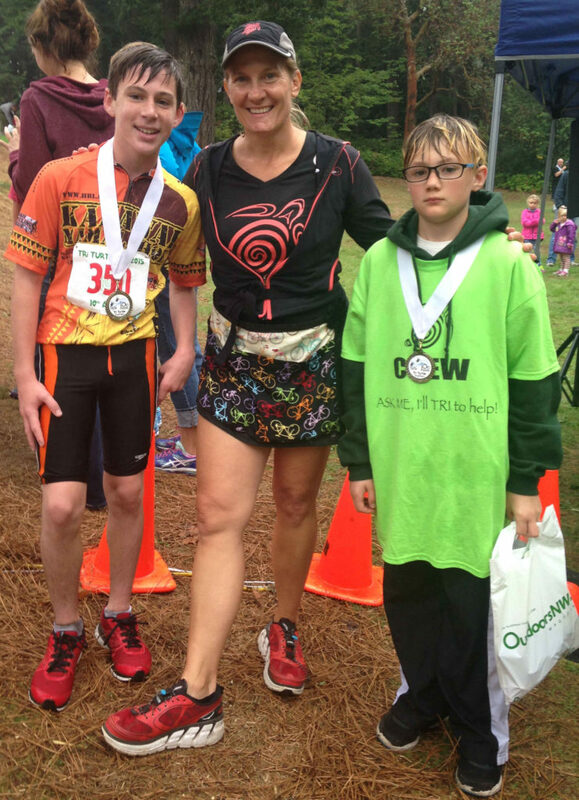 The young man on Lisa’s left completed the triathlon while the one on the right served as a race volunteer. The picture is courtesy of Lisa Ballou. About 400 participants gathered on this drizzly morning at Wildcat Park to swim, bike, and run in and around Wildcat Lake. The temperature of the water in Wildcat Lake today was below 78⁰F meaning that according to USA Triathlon rules wetsuits could be worn for the swim. The cool drizzle made the wetsuit even more desirable. The half mile (800 m) swim followed a clockwise triangular path with two right turns before exiting the lake. I made two mistakes on race morning that caused me to waste time on the swim, even if only a few tens of seconds. First, I had not identified the swim exit on the race course map. I also missed the portion of the pre-race meeting during which the exit was identified. As a result, during the final leg of the triangular-shaped course, I set a trajectory toward the area where we had entered the lake, instead of toward the actual exit which was a few tens of yards left of the start. Triathlon tip: Take time before the race to learn the course as much as possible. This should involve learning where to exit the swim typically by identifying a marker near the exit. From the exit of the water, we climbed a steep hill on our way to the transition area. Upon reaching flatter ground, the remaining jog to the transition area involved dodging, and occasionally stepping on, sharp rocks protruding from the ground. The 15.6 mile (25.1 km), out-and-back bike course took us on local roads, initially west of Wildcat County Park. At about half way toward the turnaround, the course shifted to a southwesterly direction. Sparse traffic allowed us to enjoy the evergreen trees, deciduous shrubs, and ground cover that was only occasionally interrupted by an access for a home or small business. A short distance before turning around, we exited the main road onto one that looped around to rejoin it about a half-mile southwest of where we had left it. While the scenery still included stands of tall, straight pines, this area reminded me a lot of the northern part of my home state of Minnesota with its splotches of bogs and wetlands within the forests. We then rejoined the main road for our return to the transition area. At this point, we were within 3 miles of Hood Canal, a fjord that makes up part of Puget Sound. Even though the course featured an elevation gain of between 750 and just under 900 feet (230 to 275 m), depending upon the map used, I really did not recall it being that hilly. There were two, actually three, reasons for the hilliness going unnoticed. First, except for the sizeable hill at the beginning and end of the course, most of the course consisted of modest rolling hills. Secondly, while we were riding on major traffic ways for the area, there was so little vehicle traffic on this Sunday morning, that we could enjoy the forests and wetlands along the course. Finally, and most importantly, I was distracted by concern about my tires going flat. As the drizzle continued throughout the race, more water collected on the road. Hearing a hissing sound brought back the unpleasant memories of a similar sound, the one I heard during the Rhode Island triathlon in the minutes before I crashed as a result of a flat tire. Focused on the sound and remembering the pain of the crash, I became increasingly convinced that one of my tires was losing air. With mist collecting on my glasses, it was impossible to get even a quick, clear glance at the tires to see if they were becoming flat. When I could no longer stand not knowing if a crash was imminent, I stopped along the edge of the road. After dismounting, I inspected each tire by pressing them firmly between my index finger and thumb. Thankfully, I learned that all of my suspicions had been wrong. Both tires were fully inflated, even if dripping wet. I relaxed and finished the bike leg. The 3.4 mile (5.5 km) run left the transition area toward the entrance to the park for a counterclockwise run along roads which had been cut through the woods surrounding Wildcat Lake. The tree-lined run course followed the left side of the local road, traveling against the negligible Sunday morning traffic. The course included a continuous series of hills, most gradual but several quite challenging. At the top of the last hill, the course made a left turn for a final sprint to the finish line. For most triathlons, the t-shirt is provided during packet pickup either the day before or day of the race. Tri Turtle Tri was different in that the t-shirt was presented only to finishers after they crossed the finish line. Another unique feature of the t-shirt was that it included the participant’s names. My name was the top one printed on the iconic turtle’s right flipper. 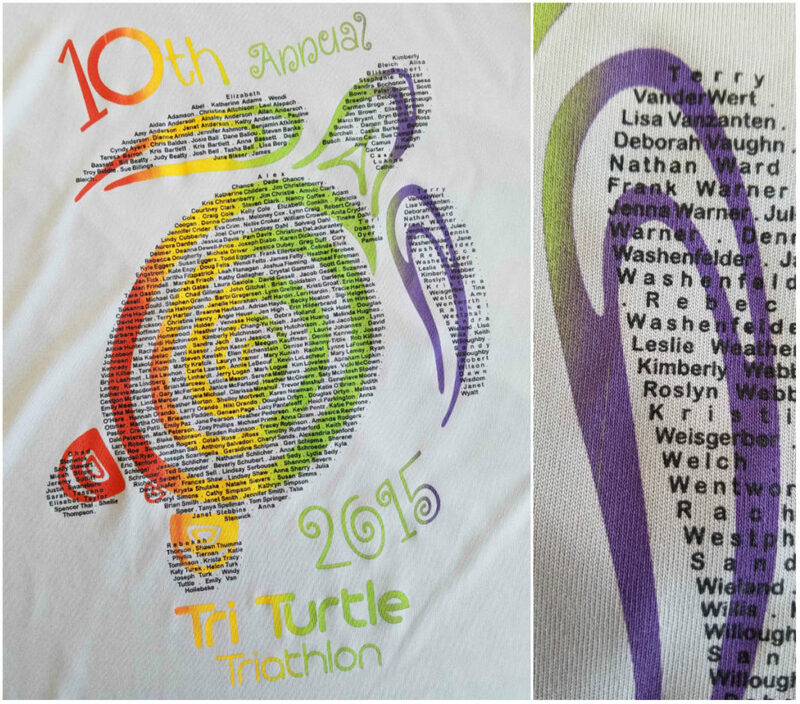 Logo from the 2015 Tri Turtle Tri finishers t-shirt (left) and the portion around the right flipper containing the names of some of the finishers, of which mine was listed at the top (right). Following the race, Joy and I went back to the hotel for a quick shower and to finish packing for the next leg of our trip. The first stop was at Anthony’s HomePort and Oyster Bar in the Seattle suburb of Des Moines for a scrumptious seafood lunch with Joy’s cousin Karyn and her son. We finished lunch around mid-afternoon and made a short trek to nearby Kent where we would stay the night before resuming our journey home the next day. The return included stops in Coeur d’Alene, Idaho; Bismarck, North Dakota; Watson, Minnesota to visit Joy’s cousin Tom; and Hector, Minnesota to visit our eldest granddaughter. First time for three races in one week. This was the first time that my name was printed on the race shirt. First race for which the T-shirt was presented after crossing the finish line only to those who completed the race.